In the 1960s a drug company by the name of Marion Merrell Dow which produced familiar drugs such as Cardizem, Gaviscon, Nicorette, and Cepacol submitted an NDA (New Drug Application) for approval of an antiemetic into the US. The drug was already approved in Europe and most of the world and was well regarded for nausea in the elderly. 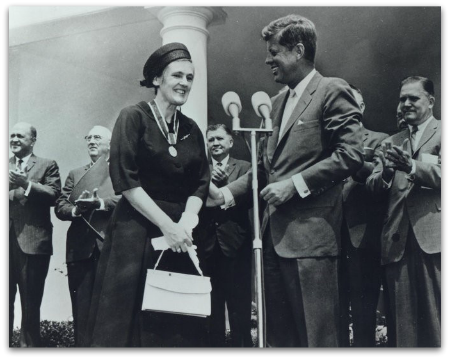 Frances OIdlham Kelsey, a Canadian woman heading the review of this new drug, Thalidomide, was a pharmacologist and had only joined the FDA a month before the application was received. Although not an approved indication, pregnant women were given Thalidomide to assist them with “morning sickness” which is fairly common during pregnancy. Dr. Kelsey refused to approve the drug in the US due to her belief that the drug lacked data for safety. While the pharmaceutical company sued to gain consent to market in the US, she successfully delayed Thalidomide’s approval for nearly 2 years. Soon, tens of thousands of reports of children being born with deformities and even more dying in the womb began to surface in women who had been taking Thalidomide. Marion Merrell Dow quickly withdrew it’s application and Dr. Kelsey was praised as a savior for standing strong against the pharma company. In 1962, the FDA quickly passed a law (Kefauver Harris Amendment) which required a company to submit safety and efficacy data for approval when previously only safety was required. Dr. Kelsey was promoted to head of the drug safety department for years at the FDA and is also regarded for writing stringent medical testing regulations which are used worldwide today. In 2000 Dr. Kelsey was inducted into the National Women’s Hall of Fame joining other great women including Eleanor Roosevelt and Helen Keller. It’s important that we honor a woman who was responsible for saving so many lives, possibly even some of us born in the 60s, and has had such a tremendous influence on history.